TWO STATES FROM HIS DAUGHTER, AND THE MISSILES HAVE BEEN LAUNCHED...Jack Archer is a train wreck. Stripped of his medical license, his marriage destroyed, hollowed out by grief and guilt, and drinking to manage a pain the surgeons insist is all in his head. He'd have to climb for days just to reach the gutter. And then a call from an old friend changes everything.Something terrible is happening on the west coast. A nuclear blast has sent the nation into chaos and panic. The government has triggered CONDITION BLACK, a chilling secret contingency designed to be the last resort after the last resort has failed, and Jack's ex-wife and seven year old daughter are standing directly in the line of fire.If Karen and Emily are to stand any chance of surviving this disaster, pursued by enemies unknown and facing a government that has already marked them as expendable, Jack will have to cast his demons aside and summon a strength he never knew he possessed.Can he save his family in the terrifying chaos of a nuclear apocalypse? Can he outrun nuclear fallout and dodge devastating EMP attacks? 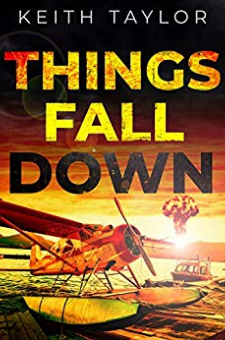 Can he fight his way though the madness and earn one final shot at redemption, or is Jack Archer cursed to lose another child?THINGS FALL DOWN is the opening novel of the lightning-paced, heart-stopping, gut-wrenching Jack Archer post-apocalyptic survival series.